I've lived in range of a grill for ten days now and I still haven't used it. I have not had reliable grill access for over five years so I thought I'd be taking more advantage of this. Unfortunately I haven't had a great deal of free time to be cooking these days. Last night was no different. Getting home late it was all I could do to turn on the oven, chop up some vegetables, and throw them in to roast while I showered and caught up on some other miscellaneous work. I have become quite fond of roasting in the recent years. Now that we live in an apartment with ventilation and roasting does not mean triple degree room temperatures even in the dead of winter, roasting has gained a bit more luster under these circumstances. Whilst the roasting occurred, I threw together a quick salad. This salad isn't exactly a typical depiction of our Thanksgiving leftovers, however, we are running out of leftovers to utilize. 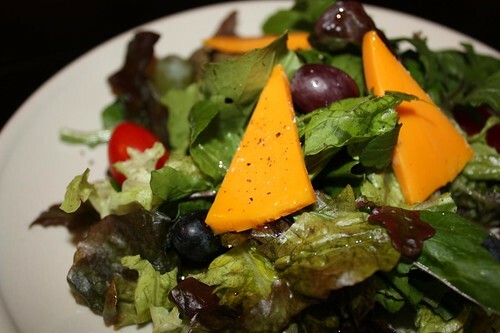 I threw this together with the mimolette, red grapes, green grapes, black grapes, and some sweet Connecticut grape tomatoes. The main course was assorted roasted farm vegetables: shallot, hot wax pepper, onion, celery, celery greens, acorn squash, and a little leftover butternut from Thanksgiving. 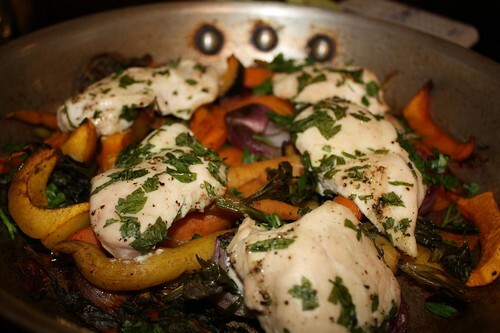 I sauteed them with a little olive oil (no garlic to be found) and sprinkled lightly with a touch of cinnamon and cardamom. Normally I think baked chicken is kind of lame. I guess there's really no way to really define baked chicken. They taught me at culinary school that baking only happens to something that is made from a dough or batter. In my mind I guess baked chicken is chicken that is placed into the oven cold with no searing. Before last night I'd never used this technique. Of course the term technique is used to cover up for my incredible laziness and lack of preparation time. In the past I have always seared and finished in the oven. Last night I tossed in salt, pepper, and roughly chopped parsley from the farm. The result was pretty good. The parsley from this week's farm pick up has been exceptional. A couple of years ago I would have laughed at the thought of exceptional parsley. It's kind of like exceptional water. 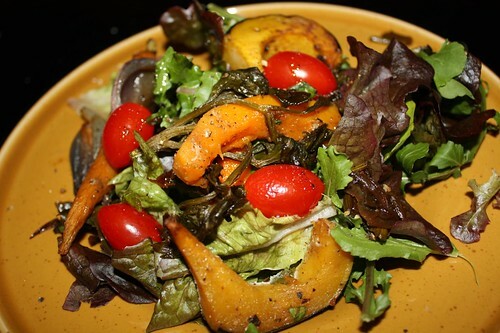 Tonight I used the leftover roasted vegetables from last night to make this salad along with the red leaf, arugula, and Connecticut sweet grape tomatoes. On Tuesday I was fortunate enough to get my hands on some burrata. 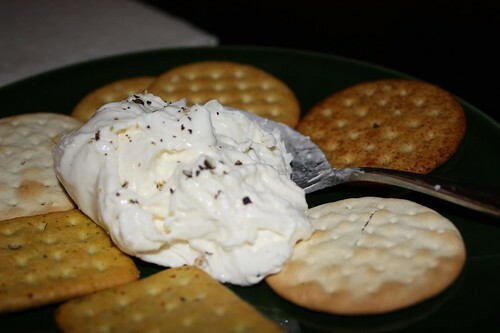 The only disadvantage to having something as delicious as burrata is t nohat one feels guitly even combining it with something as neutral as a water cracker. Burrata may be best enjoyed accompanied by only a spoon. I used to work at a job where one of my responsibilities was to make 5 gallons of two to three different varieties of soup a day from leftover items we had lying around. 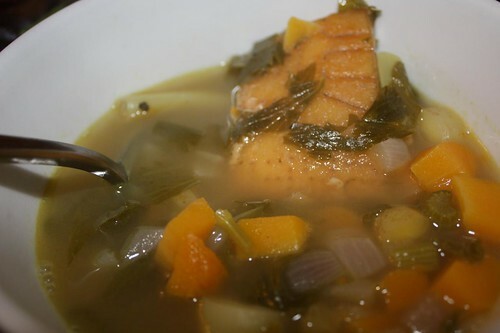 In that time I became fairly adept at coming up with soups as I went along. Tonight I relived my roots by making a soup from some assorted farm leftovers including carrots, onion, celery, butternut squash, and the rind from a piece of Parmigiano. The result was actually not that great. I think, perhaps, I may have gone a little heavy on the celery greens as the soup seemed to taste predominantly of celery. For dessert we ate a wedding favor from last weekend's wedding. 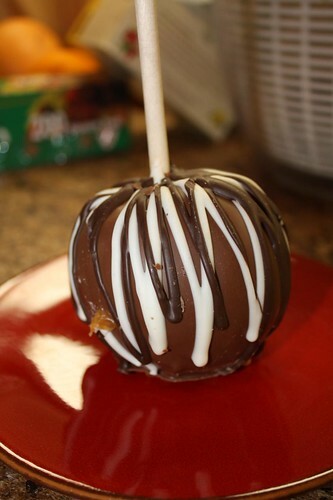 It was Jen's all time favorite thing in the world, a chocolate/caramel apple. This particular apple was from Dipalicious in Rhode Island. We still have a giant bag of candy from the wedding and a fridge and freezer full of leftover desserts from Canadian Thanksgiving. So pretty much it's the best thing ever.